The 2019 presidential aspiration of former Vice President Atiku Abubakar received a major boost as a former President, Chief Olusegun Obasanjo, publicly endorsed him for the Presidency. 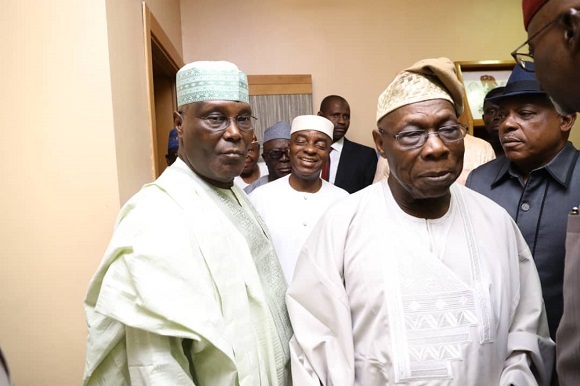 Obasanjo declared that Atiku, who is the Peoples Democratic Party (PDP) presidential candidate, has the capacity to perform better than incumbent president Muhammadu Buhari. He spoke at a press conference in Abeokuta, Ogun State shortly after the former vice president met him behind closed doors. Atiku was accompanied by the PDP National Chairman, Prince Uche Secondus, former governor of Ogun State, Otunba Gbenga Daniel, former Cross River State Governor, Senator Liyel Imoke, and Senator Ben Murray-Bruce, among others. The PDP presidential candidate’s meeting with his former boss was ostensibly historic and significant as notable religious leaders were also on hand to ‘bless’ the reconciliation. The clerics included a prominent Kaduna-based Islamic scholar, Sheik Ahmad Gumi, Catholic Bishop of Sokoto Diocese, Bishop Matthew Kukah, and the founder of Living Faith Church Worldwide, Bishop David Oyedepo. In giving his endorsement, Obasanjo said Atiku was the best man for the nation’s Presidency given the current circumstances. According to him, the former VP has the widest and greatest exposure, experience, outreach as well as the best machinery and preparation for the 2019 campaign. While describing Atiku as “the president-to-be,” Obasanjo urged him to work with other aspirants that contested the presidential ticket with him in the interest of the country. He said, “From what I personally know of you, you have capacity to perform better than the incumbent. You surely understand the economy better; you have business experience, which can make your administration business-friendly and boost the economy and provide jobs. “You have better outreach nationally and internationally and that can translate to better management of foreign affairs. You are more accessible and less inflexible and more open to all parts of the country in many ways. “As Pastor Bakare, one-time running mate of the incumbent President said, ‘You are a wazobia man.’ And that should help you in confronting the confrontable and shunning nepotism. “As you know, along the road to where you are today, many leaders and ordinary people cooperated and overtly and covertly worked hard. On your behalf, I thank them all. May their coast continue to be expanded. Obasanjo noted that Atiku could have succeeded him in 2007 but for the latter’s action then against the PDP, the government and the country. He, however, observed that since the ex-VP had rediscovered and repositioned himself, he is on the way to clinching the presidency.